Qué tal, mis felicitaciones por el trabajo, está quedando de lo mejor, ¡ánimo!. Gracias José Jorge! Ví hoy el post que hicieron en su sitio, muchas gracias! Y gracias por el mirror! Les envié también un mensaje en Twitter. could you host the downloads somewhere with some bandwidth? I'm working right now to make a torrent for all the versions. 1. Go to the ESP\Components\Minibloq\v1.0 subdir. There you will see a “Minibloq.exe” file. Rename or delete it. 3. Go back and execute MinibloqRun.exe. I hope this may help by now until I set up a torrent. Nice app., shame about the requirement for a Windows system. Are there not cross-platform SDKs in existence by now? 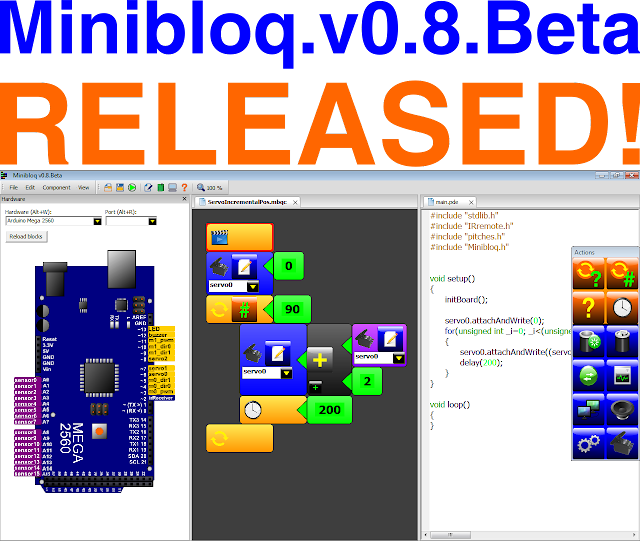 Hi Vik, in fact, Minibloq was made with GCC and wxWidgets. Both are cross platform, and I selected this toolchain with other versions in mind. The problem is that I did not have time yet to make other versions. Anyway, Windows is not required, you can run it under Linux, and we made a bunch of tests under different Linux flavors. You will need Wine, and there are still some minor issues under Linux, but it works just fine, even in very small netbooks, like the OLPC XO (running Fedora) or in laptops with Ubuntu or Suse. The only desktop major OS where Minibloq still does not run is Mac OS X, but we are working ot have it running there too. I forget: You can run Minibloq on Mac with Virtual Box. We tested it that way and it runs without problems. I know it's not the best solution, but may be a temporal workaround. Hi Charlie, I'm working to set up a forum as soon as possible. The bug tracker will come also, but in the middle future. There is a lot of work with the project these days. I took note of your requirement. However, it's not an easy feature, to import PDE files. It was not in the roadmap but I'm thinking about it. Anyway, if I finally can't implement it in the future, once the project becomes open source (this will happend as soon as I finish the "core" features) may be other programmer could help with that. I can provide a mirror too. Located in Finland. I'm making my thesis about using arduino in teaching, I will mention minibloq as an option. Hi Jari, many many thanks! I will try to update today this site mentioning your mirror also. If you need some data about Minibloq for your thesis, you can become a follower in Twitter so I will be able to send to you my email by private message. Hi Jari, I have updated the downloads page, so now there is a link to your mirror. Thanks! Hi DenFish, thanks! No problem with the exclamations! I'm working on a better website structure (progresively). I will set up very soon both a forum and probably will add a paypal donation button on the download page.